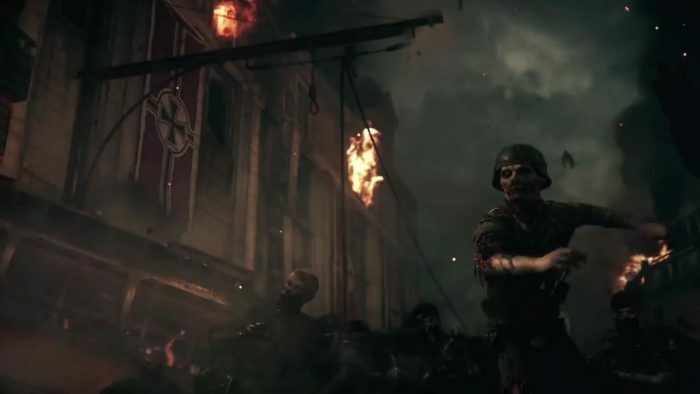 In ‘The Shadowed Throne’, the third Zombies map for Call of Duty: WW2, your team of allied adventurers enter the heart of the Third Reich in search of a terrible artifact. Berlin is in chaos, the undead are swarming the wartorn streets in this alternate history version of events — and there are ten new achievements / trophies to unlock! The map includes an all-new, all-complicated Easter egg that leads to, presumably, a final boss battle against a creature called the Stadtjäger. Figuring out labyrinthine Easter eggs is half the fun, and achievements / trophies usually give us our first clues. First of all is that name — the Stadtjager (or “City Hunter” in German) sounds like an imposing boss monster, which is pretty welcome after the lack of a unique final boss in ‘The Darkest Shore’ DLC map. The achievements / trophies also reveal some potentially interesting locations, like the church and the museum. There’s also a noticeable focus on melee weapons, including the (presumably) all-powerful and upgradeable blade. In The Shadowed Throne, defeat the Stadtjäger. In The Shadowed Throne, find the Ubersprengen. In The Shadowed Throne, reach wave 15 using only melee weapons. In The Shadowed Throne, kill 50 Gekocht with the special weapon in one match. In The Shadowed Throne, keep a Gekocht alive on the stage for 1 minute. In The Shadowed Throne, obtain the Blade without firing a gunshot. In The Shadowed Throne, after round 20, survive at least 2 full rounds without anyone leaving the church. In The Shadowed Throne, while inside the museum, kill 250 zombies with the Blade in a single match. In The Shadowed Throne, kill a Wustling using each melee weapon in a single match.